Eta keeps the world on the move. The Eta pump is a classic that has proved successful over decades and has been a constant focus of optimisation for KSB. 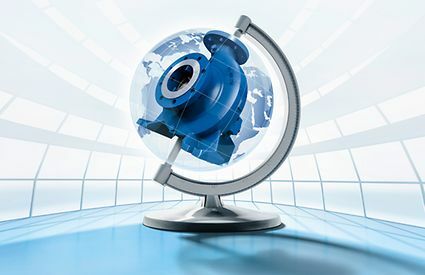 It also represents the globe's most popular family of standardised water pumps – 1.5 million of them are in use worldwide. This is all the more remarkable when one considers that every Eta is manufactured to specific customer requirements. The Eta family comprises a total of 43 different sizes. These can be run with 2-, 4- or 6-pole motors. The range has been extended to include additional sizes, so that pumps can now be selected even closer to the best efficiency point. In addition, every Eta built by KSB is fitted with an impeller that is trimmed exactly to the optimum operating point. Over the years, the Eta pumps have reached such a level of technical refinement that our customers can totally depend on the excellent characteristics of these globally standardised products. Thanks to their versatility, the pumps of the Eta family have become firmly established in numerous industrial applications, in the building services sector, and in water and energy supply. At the same time, Eta pumps set standards in terms of availability and servicing: new products and spare parts can be supplied at short notice while assembly and dismantling are extremely straightforward. One standard worldwide. The benefits of our Eta pumps speak for themselves. Motor options ranging from standard asynchronous motors to our high-efficiency IE4-compliant KSB SuPremE® motors (IE4 to IEC/CD 60034-30 Ed. 2): benefit from the optimum drive solution to match any application. Our PumpDrive, Hyamatic, and LevelControl automation options provide optimum control and monitoring functions for your pump system. Experience the world's most efficient magnet-less pump set. Whenever space is tight, this pump is the right choice.